I have only recently become a fishy person. I have loved shellfish of all kinds all my life, but regular old fish? Not so much. My mama kept telling me if I would just TRY it I would like it, and while so far that has not worked with eggplant, mushrooms, olives or beans of any kind, I gotta hand to it to her on fish, because now I LOVE FISH. And since it took me so dang long to get around to liking seafood, I have many many many recipes I need to figure out so that I get all the fishies that are coming to me. My currently favorite, easy, totally reliable way to cook it? In parchment packages. It’s like getting a fishy present! See that delectable sauce on the upper left of the picture? Oh yes. In this case, it’s been flavored up by the generous smear of pesto I put on the fish before I topped it with the sliced veggies. I also gave the veggies a generous sprinkle of fresh ground pepper and sea salt. 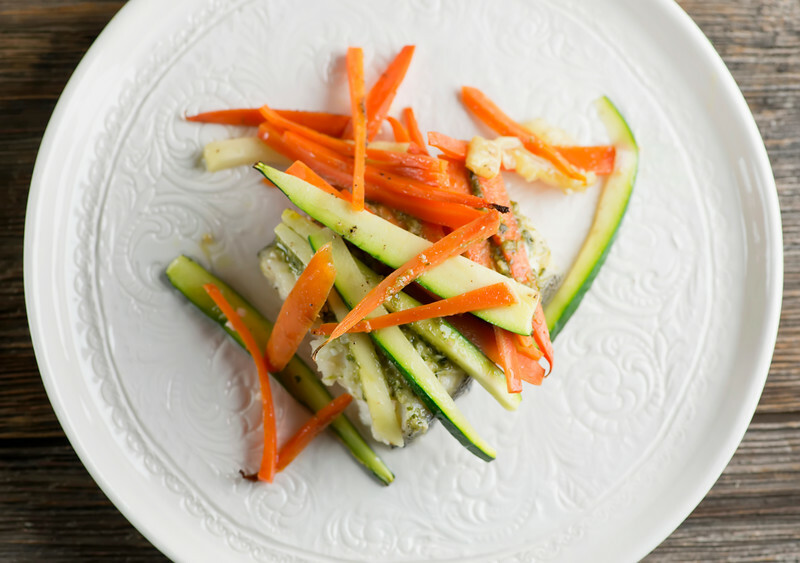 Now, I used halibut for the fish, and carrots and zucchini for the veggies, but tonight I am making this with red snapper, and you could also use cod or tilapia. All The Fish. It’s a cornucopia. You can also sub out all kinds of veggies – asparagus, halved cherry tomatoes, sliced sweet onion – you get the idea. …there is no basil in sight, so I went for the jarred kind. Side note: this beauty and a bunch of her friends were literally at my front door last weekend. At the door. As in, “we’re here for brunch!” As much as I bemoan the fact that they chow down on my plants, I secretly love them. 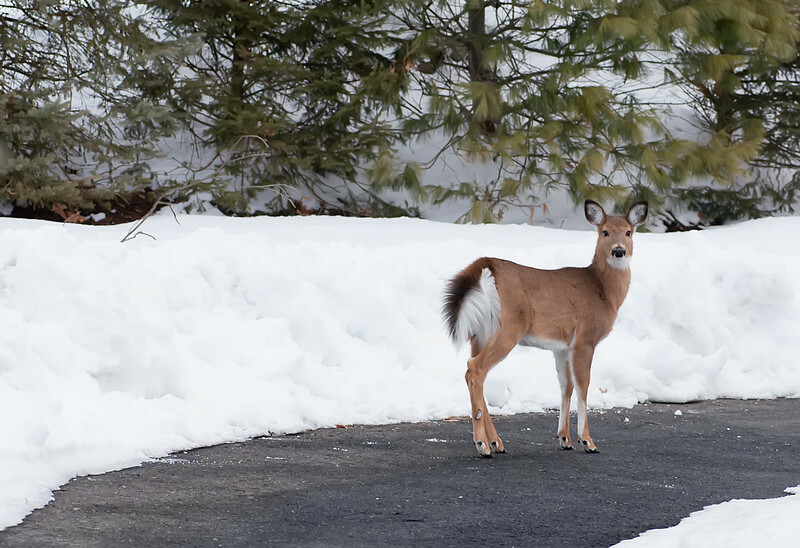 I mean, LOOK at that fluffy tail. Once you open up the packets, just pour it all onto a plate, making sure you drizzle everything with the cooking juices. You could pour it onto rice or polenta, but it’s also perfect all by its fish and veggie self. Onward to new seafood adventures – let me know if you have any favorites I should try! 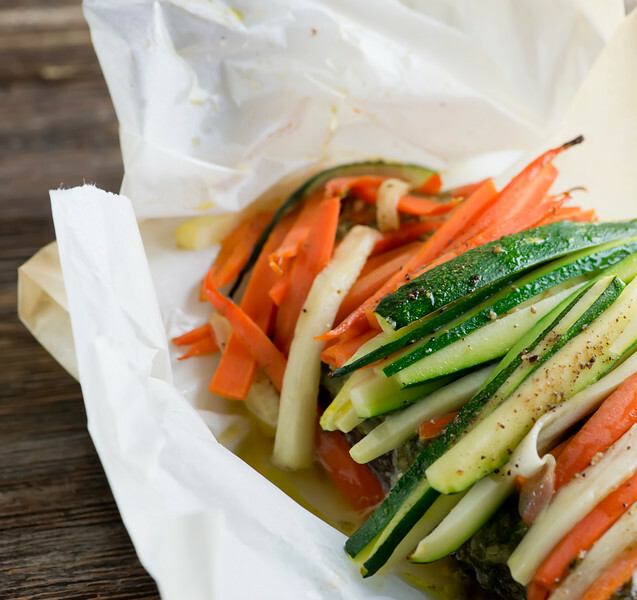 Fish, vegetables and pesto cook up to tender perfect in this recipe for halibut and spring veggies in parchment packages. Preheat oven to 425. Cut out four squares of parchment, about 12 inches long and wide. Paint a little pesto on the center of each square, and place a piece of fish on top. Spread with more pesto and top with veggies. Sprinkle with a little salt and pepper. Drizzle about a teaspoon of olive oil on top of each serving. Fold parchment as follows: left side over the fish to the right, then the right side over to the left, so they overlap. Now fold the top and bottom ends underneath to make a loose packet. 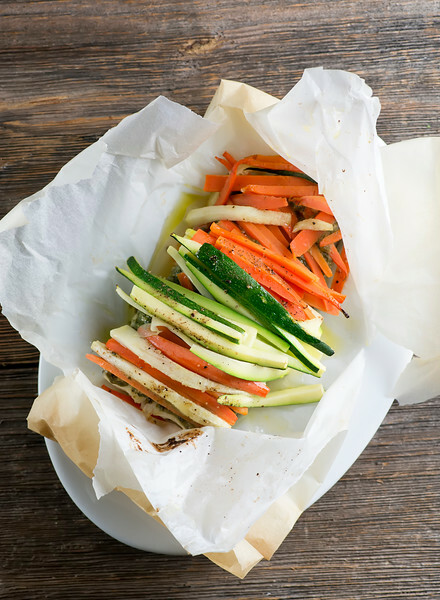 Place the packets on a rimmed baking sheet (just in case of any leakage) and bake for 15 minutes. Carefully open the packets, transfer to plates (making sure you drizzle the drippings on top) and serve at once! 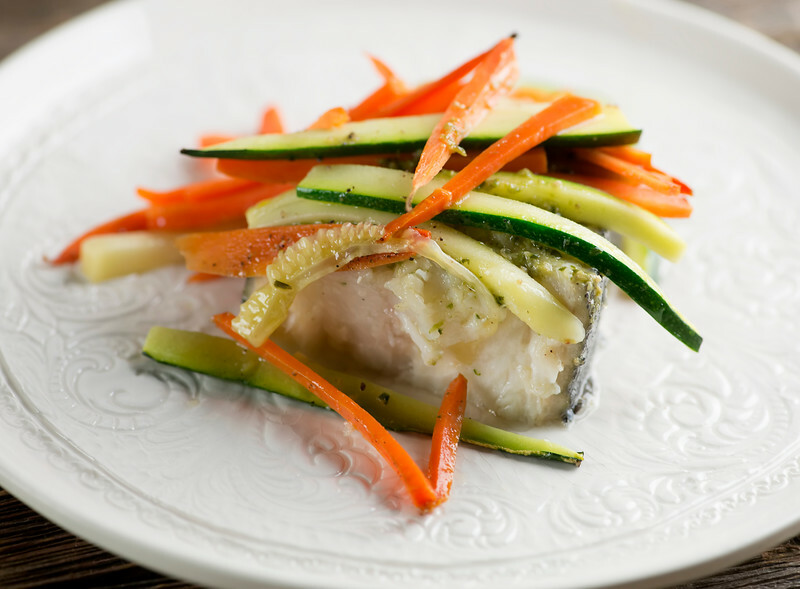 You can substitute many kinds of fish filets for the halibut, such as cod, snapper and tilapia, and same goes for the veggies. Be creative! This is a great way to cook fish! Glad you are onboard. Love the pesto so will have to try that. A mention on tilapia… It is not a good fish to purchase as a rule. It is farmed in generally less than desirable ways. I won’t go into detail as you can read if you want to know more. I avoid it completely… Just an FYI! Hope all is well in your still snowy world.. Wish you could send it to CA! You are too funny! I love that you are now into “fishy presents”! And this fishy present looks like one I’d love!!! Dee-licious! Welcome to the fishy world, Kate! simple. delicious. and well constructed!